Aluplast has showcased a trio of new product innovations at its series of International Innovation Days aimed at sharing knowledge and best practice amongst its fabricator base world-wide. Held recently in Cardiff, this included the global launch of Woodec, Aluplast’s next generation PVC-U foil, bringing exquisite and life-like woodgrain detailing to low maintenance PVC-U products. 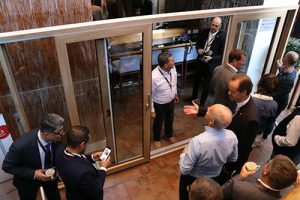 The German systems leader, also chose the event, to unveil its highly innovative Smart-Slide inline sliding door, for the first time in the UK. This employs highly innovative hardware to combine ultra-smooth operation with self-closing technology, creating an exceptional weather seal. The innovation days also included a series of guest presenters including, Haffner’s Mike James and Dave Thomas, who discussed the latest innovations in machinery and timber-type/traditional 90∞ welds in PVC-U flush casement manufacture and Graeme Bailey, Businessmicros, who argued for a shift in the industry to deliver increased value throughout the supply chain through optimisation. Other speakers included James Clayson, DGlass, who made the case for ‘up-selling’ PVC-U; Keith White, Managing Director, Aluplast in the UK, who charted the growth of the UK heritage market for this largely international audience, plus Maco’s Craig Bryant on hardware innovation. Capable of spanning openings of more than 4m wide by up to 2.5M high, Smart-Slide is the latest of three new UK product launches by Aluplast in the last two-months. The 70mm sliding door system has been developed to deliver significant efficiencies in fabrication and exceptional through life performance. Maximising the glazed area and able to accommodate 28mm through to 40mm glazed units, it delivers U-values as low as 1.3 W/m2K. This is launched less than a year since Aluplast’s Lift-and-Slide door which delivers U-values as low as 0.65 W/m2K and the capability to span distances openings of 6.5m X 2.8m with just two sashes.